Bonfires on the Move! Technology solving mobility issues! 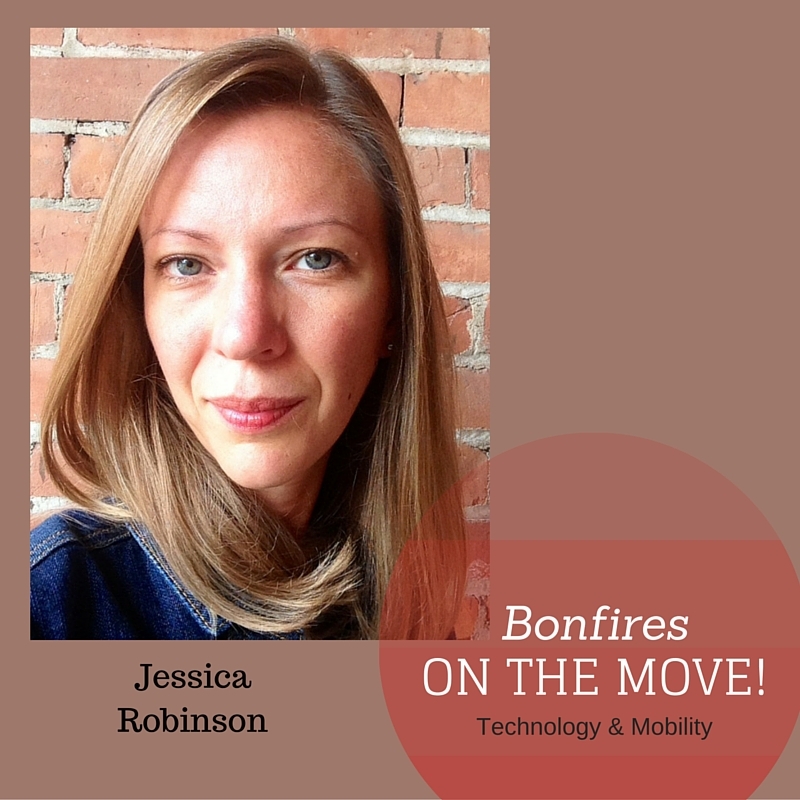 Meet the new host of Bonfires on the Move, Jessica Robinson. Jessica and Romy discuss her new segment and the types of guests she will be interviewing. As technology is used to solve mobility issues, Jessica will be bringing front-line trends and fresh ideas to our listeners. Social Enterprise has technology all over it! Romy: So I’m talking today with Jessica Robinson for the Bonfires of Social Enterprise. It looks like we’ve had such popularity with some of the guests that she’s identified, that we’re going to start a regular segment with you, Jessica. That’s what we’re talking about today. Jessica: Yeah, I’m so excited, Romy. I can’t wait to do this. Romy: (Laughs) I know. Me, too. Hey, I just thought, we’d let the listeners know how we connected. You and I were guest judges at an event around social enterprise, and we connected there. And then you introduced me to one of our very popular guests from Season 1, from SPLT Fares. Do you want to tell me a little bit about what you were doing at the time? Jessica: Yes. So, as you mentioned, we met as co-judges, and I was excited to be part of that event focused on social enterprise. But I met Anya, the founder of SPLT, uh, because she had brought her company to Detroit as part of the very first Techstars Mobility program here in the city. And when I met you and heard what you were working on and had been talking to Anya about their vision for her company, it just seemed like a perfect fit, and I had to put you two in touch. Jessica: Yeah. I think it’s great. And as I started to think about the types of folks that we could bring on to the show or expose to the listeners here, I just keep getting more excited. There’s just so much happening in the space right now and attention to the way we move and get around here, not just in the US but really across the globe, that this is the perfect timing for this conversation. Romy: Jessica, I know, just for the listeners, your bio will be online, but could you give them just a little bit of a feel of your background? Jessica: Yeah, I’d be glad to. It’s, funny when you always try and think of telling your story of how you got to this point because there’s so many bits and pieces of my background that I really see, have brought me into this place right now and just my love for transportation and mobility. I had a chance to work at Zipcar, which is the world’s leading, car sharing organization for a number of years. I started with them all the way back in 2007 when the idea of new mobility solutions and mobility technology was still very early. And I remember many conversations at the time, people laughing or doubting that this would ever change anything here in the US. So with Zipcar, I did a number of different things, everything from marketing to building the community membership base to, something a little more boring [sounding] but actually really interesting, which was managing parking for the company in San Francisco. And in doing so, I had a chance to get a glimpse at a different side of business, which I think comes full circle in many ways now, and that was working with city officials who were really trying to grapple with what do we do as civic leaders when we have all of these new companies and startups coming in. They were concerned about risk and what happens to my voters if they get in an accident or what does this mean for meter revenue in my city. Lots of different questions. And I really enjoyed grappling with them together and really being on the forefront of that. So I was with Zipcar for a number of years, and that actually led me to Detroit. I was working on a new market expansion for the company and had an opportunity to present to the company leaders a list of cities that I thought we should go to next. And much to their surprise, Detroit was one of those cities. And for me, having a chance to step back and look at North America and the places that, there was both the business opportunity but a need, Detroit was one of them that came to mind, for many reasons. And I vividly remember that presentation to the leaders around the big board room. I think our CEO probably dropped his cup of coffee on the floor. I had a chance to see some things about the city that, maybe others haven’t yet in terms of, both the economic investment that was going on here, but again, also the need given the context with that just the broad geography, how big of a city we are here but also the availability of public transportation and just how car-dependent we are here. And so there’s a quite a long pause this time on the phone, and we talked through, and it made sense. That’s how I wound up in the motor city. I’ve been here for a couple of years. So again, Detroit’s Zipcar is kind of what brought me to this phase. But I think some of these roots go deeper. Before I worked at Zipcar, I actually had a chance to work in the tea importing, which is a pretty specialized segment of the world. But what I really took from that time was the company I was with was focused on fair trade and organic products. And as a young person in business, what I really learned was that you can have a viable business model but also still do good for people and the planet, and it didn’t have to be an earthy, crunchy type of a thing. It actually could make really strong business sense. So those roots very much have stuck with me throughout all of it. And so, with those roots in mind, that kind of brings us to today, where I work focusing on innovation within organizations that are very, very large, Fortune 500, but marrying them with startups. So it could be a couple of founders with an idea all the way again to innovation and investment departments at some of the world’s leading brands. And I feel really lucky that I have the chance to see these innovators as early on and starting to piece together exactly what it means to run their business but in mobility, specifically, the impact that they want to have. It’s a little bit about my background. If anyone is also interested to know, I absolutely love bicycling, and I think that’s a part I can’t leave out. And for me, the bike represents so much. It’s a very simple technology, but it’s been around forever. And I think if you’d think about what the bicycle means to kids, it’s one of our first tastes of freedom. And for me, I grew up in the suburbs where the bike was the first chance I got to kind of leave home and explore on my own. But I started as a bike commuter when I lived in Seattle and really believe in its potential as part of the transportation mobility solutions, for us here in the US and globally for the future. So, don’t be surprised if a bike makes its way, in here and there because I really am passionate about what the bike means. Romy: (Laughs) That’s so great. As soon as you said that about the bicycle, I was transported back to my first bicycle that I was able to buy I remember with my babysitting money. And to me, it just represented pure freedom to move around. And what a nice circle back around because so many of these mobility issues affect people in this sort of rip-tied way. It can affect their employment. It can affect so many things including things like food access right here in Detroit. When you talked about your last position there, and you were starting to watch a lot of this innovation, were you surprised Jessica at how many different issues technologies can solve with mobility? Jessica: Yeah. I think so what’s interesting is entrepreneurs will believe in their technology with such passion. And I think sometimes they’d only see one piece of it. I’ve been really lucky to be involved in a number of different aspects of it. So I can see a little bit more of the system and the pieces all coming together. And I think transportation, you mentioned its access to food, its access to jobs; it ‘s actually a critical piece of our infrastructure and our lives. And I think about the conversations that I had with people talking about car sharing, and it becomes very personal very quickly. And for some, it means saving for a vacation. For some, it means being able to go back to school. But it’s really easy to forget that in America, the numbers are actually really staggering, that transportation is actually the second largest household expense after the cost of our houses themselves. And it’s, for most people, it’s about a quarter of our income we spend on transportation if we’re in a car-dependent area. So when you think about technology, it could be something as simple as a car that’s more fuel-efficient. That is a major savings and a major impact. It could be something that encourages us getting to work with co-workers like SPLT. Or it could be something much bigger that. We haven’t even thought of yet. That’s what I love is the overlay of the technology, the personal, and what does it mean for cities and how we plan and think about the future. Romy: There’s so much that could be done there. I think you’re right that transportation just is in every part of our living and being in today’s world. And the timing and history for us to even be doing this particular show are amazing. And we almost couldn’t have done this ten years ago just because all of the factors weren’t lining up. People now desire to solve social issues. I find everywhere we travel around the globe, there’s such a heart to how people are turning their attention to others even though it appears as (laughs) it’s all about iPhones and my picture in this. I still find this incredible current of people turning their attention to others solving the social issues. Is there anything that surprised you, Jessica, about what could be solved with, with the technology? Jessica: I think things that come to mind are the enthusiasm of some of these entrepreneurs. They would probably tell you, no, nothing is unsolvable with technology. But I think that some of those bigger issues that we’re facing. We talked a little bit about household income. And that’s very personal, but you can take it to the other level, the stream of macro and global issues. And one of the things that I’ve been thinking about a lot lately, given not just the recent discussions in Paris around climate change and COP21. But just air pollution and something as literally as small air particles, but how big of an impact that has on global health. And I was just reading it’s a crazy number, something like 2 million people a year in Europe and China, they actually die due to complications related to air pollution. And most of the cause of that air pollution is smog, which is really Detroit’s transportation choices. I’m lucky enough to be here in the US where we have strong regulatory controls. But I think about transportation technology and these innovations that are happening in China and India, where it’s completely business driven, but it’s going to have a massive impact on the people there. So, I am, I guess, a technologist at heart and a hopeful at heart that these technologies can take on these big challenges. I think the flip side is we always have to consider the human impact of that because it’s very easy to prioritize technology, maybe without knowing what it’s going to do or, really have [a clear] grasp of it yet before we launch it out there. I think about the heads-up displays in cars which make sure that we’re not looking down at our iPhones and cell phones and texting and tweeting while we’re driving. There’s a lot of technology to come, which will hopefully influence and significantly impact that way we’re getting around. Romy: Yeah. I think I just heard of once; someone told me that they already have the technology to put podcast channels in cars, which really excites me (laughs). Jessica: There we go. I like that one, too. Romy: So getting back to some of those things, what are you noticing is maybe trends? Or what are you observing [right] now while we’re preparing the show in early 2016? Jessica: Yeah. Well, oh my gosh, there’s just so much happening. I mean, literally, as we speak, companies are making announcements left and right at the Consumer Electronic Show out in Las Vegas. And it’s a little, a little bit industry insider but that show really has come to be a place where auto manufacturers of all companies are making their big launches and kind of big statements for the year. So we’ve got that going on. We have the auto show coming here to Detroit just next week. I’m actually headed out this weekend to a little event called The Transportation Camp, which is part of the National Academy of Sciences annual meeting for their Transportation Research Board. So these are some of the top thinkers in academic jobs around the world coming together to share white papers about the research that they’re doing. But this transportation camp is kind of younger professionals, students who are working with these leaders to say, “Okay, we’ve got the white paper, we’ve got the knowledge, but how are we actually going to put something into action now?” So I’m really excited to go out and be part of those conversations there. And then I just feel like mobility is in the news every day. It probably is because it’s my world. But there’s crazy things, too, like, we’re still learning about bike sharing here in the US, where instead of owning a bike, you can borrow one, through a program in the city. In Europe, they have cargo bike sharing so that you can, go to your local home construction store and stock up on your home supplies or pick up your kids after school. So I love, getting snippets of what’s happening in other countries and thinking about what that might mean for impact or opportunity here in the US. It’s funny, a friend just asked me the other day, and he said, “What do you think your top mobility trends are for the year?” And I kind of thought for a minute, and I had a couple. One is data. And, in technology, it’s something we hear a lot about. Everyone wants to be a platform or create access to data as their kind of strategic business model. But I really do think this year in mobility tech; that ‘s going to come to a whole new level. And companies or government or whoever is involved that are thinking about, not just capturing data and kind of using it internally, but leveraging the numbers that the activity is creating to generate new knowledge about where people want to go, what they want to do, what they’re willing to pay, the time, whatever it is, I think data is going to be a big trend for this year. Related to that is actually a connection between services. We started to see this for a little while between, let’s say, a parking app that can tell you where to park your car, maybe partnered with a rental car. But I actually think this year, the connection is going to come to a lot more between public and private services. We saw an announcement just the end of 2015 that lift the ride sharing. The company had partnered with [Dart] in Dallas to bring the two services together and make it more seamless. I think that’s going to be a big trend this year is a lot of different companies, groups, agencies, talking together probably in the form of data. Bikes, I threw out just because I’m a chair for the underdog on this one. I actually do think we’ll see, especially here in the US, a lot of more focus on bikes, and bike infrastructure. And we know that in bicycling, feeling safe is a big part of people’s willingness to get out and try biking for the first time. So I’m always [inaudible 00:20:44] with bikes as I mentioned before. And then, kind of a wild card I throw out is, it’s a little nerdy but, insurance risk, how did we quantify risk in banking? We’re starting to see different kind of ownership models come into play beyond the car sharing or bike sharing that we have today where it might be fractional ownership or lease to own. There’s a company in Africa that I saw that is actually doing kind of the lease-to-own scheme for the motorcycle [lowped], which is quite honestly bringing a new transportation option to people that never were able to afford it before, and they’re actually able to own an asset. So, we’ll see where that goes. A lot of people are looking at that. Romy: Oh, it’s fascinating. Jessica, I’m so excited that you’re going to be leading this and picking out guests for us. Could we give a feel of some of the profile types that we might be able to get on the show this year? Jessica: Yeah, definitely. So the more I think about it, the more types of guests come to mind. Certainly I think some folks that we will be bringing on are those entrepreneurs that are at those young companies just getting started out, working on new technologies, whether it’s some new hardware piece that might go into a car or maybe it is a new app that people are looking at using. When I talk to entrepreneurs, what I’m excited about is many of them are solving a personal problem that they encountered or they saw. But what’s really exciting is with the [Global] influence, we have founders here in the US across the world, they have those different life experiences, so they’re solving a different set of problems than the first generation of mobility innovators we’re tackling. So, you’ve got people solving youth transportation issues, people looking at mobility in one of the original senses of the word, which is kind of physical mobility and, retirees and elder care, and what are, what are those transportation needs. So, I’m looking forward to having a broad set of entrepreneurs that are looking at solving different problems but actually bringing them to market. And I think that’s what’s cool with startups. Every time I have a chance to sit down with the founder, I’m perpetually struck by how quickly they’re able to take an idea and put some pieces into place and test and learn. So what I think that I really want to dive into a little bit more is what are those learnings, where everyone wants to talk about what’s going well and what’s succeeding and their latest partnership. But those learnings and those stumblings are important, too. I actually just read earlier today that a good way to think about failure, which is carrying something a lot of us learned to stop doing when we’re children. Failure can be looked at as a bruise, but it shouldn’t be looked at as a tattoo. And I actually thought that was really cool because it, it demonstrates so clearly the mindset of the people working on these innovations. And a stumble is a way forward rather than a fallback. So I want to talk about these things that didn’t go right as well and what they’ve learned from them. So hopefully, we’ll be able to [tell] those stories out of people. I think the second group of folks that I’m hoping to talk to are those people on the ground at the government level because they’re also grappling with these questions about what is this technology going to do? Do I need to regulate it? Do I need to tax it? Should we let it go and see what happens? What does this mean for incumbent businesses that maybe lobby and then pay for my election funds? It’s very complex, but, whether its city planners, transportation planners, a lot of people are having to grapple with this technology in different ways. So, I think those will be some interesting conversations. And then the last group might bring a friend or two on board from the industry and get their insights on the trends that they’re seeing and the technologies that they’re looking out for in the year ahead. Jessica: I know. The list is getting longer. Romy: Another thing I’m really excited about you as our industry expert, in my opinion, you are the industry expert, and you touched almost all of the different, what I would call organizational levels, the government, the non-profit, these new startups, the corporations. You’re really touching, and you’re traveling around the globe. And so I just feel we can’t have a better co-host of Bonfires on The Move, huh? Jessica: Yes, I know. It’s going to be great. I can’t wait to get our first guest on with us here. Romy: The other thing I’m excited about, too, is I’m noticing a moving trend as we work with both the social entrepreneurs and the investors who kind of help support them. And for quite a while, I’d say, even up to the last year or so, investors who were interested specifically in what I would call impact investing or social ventures, they tended to dismiss technology as one of those saying, “Oh, that’s just for growth and scale. We’re talking about only the mom and pop business, so the little operation in the neighborhood.” But I’m excited to help educate everyone on what’s really happening because it really is solving the social issues. And I’m hoping really by bringing this segment as a regular element of our show that we can help everyone understand how integrated it is in our society today. We can no longer just say, well, that’s tech over there, and that’s retail and et cetera, et cetera is all coming together and start whether we like or not, and it’s interwoven with these social issues. And if we all sort of step back and take a helicopter view, we could really, as my sister would say, knit a neat sweater here. You know, we can really put together a really organic, interesting ecosystem. Jessica: Mm-hmm (affirmative). Yeah, yeah. There are so many pieces in play. And yeah, it’s exciting for me to hear you thinking about it in that way, too, because I think a connection is going to be the theme, and innovation in the silo is not going to be, I think, nearly as interesting or effective, but … For the investors. I don’t think it will be as compelling because there are too many factors at play now, to be innovating in a silo. We just can’t do it alone. Romy: Great, right. Jessica, thank you so much, I can’t wait. And listeners can go to the website and look at the calendar. The monthly show is going to be called the Bonfires on The Move, focusing on mobility with technology. And we’ll have more to come soon. Jessica: Thanks, Romy. I can’t wait to do this. I cannot wait to hear more from you both this season! What an amazing duo and such important topics, cheers to your first joint-podcast!